With the loss of a loved one, there doesnâ€™t seem to be any time or desire to write funeral thank you notes for all of the various thoughtful things our friends and families do to ease our burdens. 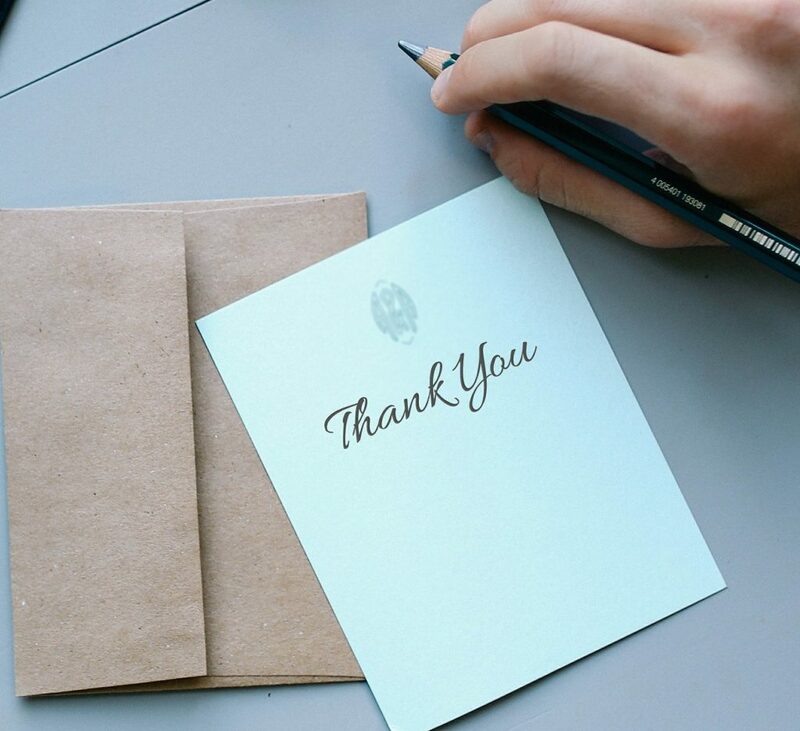 Writing a thank you note after a funeral may seem too difficult, as writing them all at once may be overwhelming, so make a quick list that notes everyone you want to thank and what for. Then, as you have time, or find yourself needing a distraction, you can write a few at a time. There is no reason to hurry; people will appreciate the thought even a month after the funeral. You don't need to thank every person who came to the funeral. Just send thank you notes to anyone who was particularly helpful or donated something. Anyone else you want to thank is at your discretion, and not dictated by etiquette. When Do You Need to Send Them? Most people choose to send thank you notes between two to six weeks after the funeral. I want to thank you for the flowers that you sent. Tiger Lilies were always Erin's favorite. I know she would be pleased that you remembered. I still miss her every day. It has been difficult to clean her room. I think I will leave it for a while. When I do, would you like the pictures she kept of the camping trip in 05â€™? The most common thank you note is for the flower arrangements. Thankfully, there is often a tag that you can remove that says who sent which ones. It is a good idea to mention of the type of flowers. This lets the recipient know that you paid attention to the details and they will appreciate your appreciation in turn. Even when you do not personally know the sender, you can still send quick thank you notes after funeral and Wake arrangements are made letting them know that their effort was appreciated. Thank you for coming to Nedâ€™s funeral. I was pleased that you were there to offer your support. I know that the two of you were close friends. He spoke highly of you. Especially about the way you always beat him at poker. He will be missed. Come by to see us soon. Call ahead and I will make your favorite- Chicken and Dumplings. You may choose to write thank you notes to those who attended the funeral. This task will be easier if you have a guest registry. That way, you do not have to try to remember who was at the funeral. This note can take some thought, especially when you are not familiar with the person. If it is an old friend, like in the above sample, a personal tone is preferable. A personal dialog that refers to the relationship shared with the deceased lets them know that you acknowledge their loss as well and an invitation to visit lets them know that although you are still mourning, they do not need to be strangers. It is a shame that Jonathon never brought you to dinner. I am sure it would have been pleasant. I do thank you for coming to the funeral. He will be missed greatly and even though I met you for the first time there, I am glad we could share in remembering him. Like the note for an unknown flower sender, a guest at the funeral that you do not know is there because they too feel the loss of your loved one. It is kind and thoughtful to send them a note thanking them for being there. Thank you so much for bringing the casserole for the wake. Billy always loved your pastas and there was enough there to feed the family for days which is a blessing because no one has felt much like cooking since the funeral. When things get back to normal, we would love to have you over for coffee and a trip down memory lane. I found that old picture album with you and Billy Kayaking in the river, yesterday. I would love to share it with you. Usually, the people who bring food are close enough to warrant a very personal thank you note. In the above sample, Sarah not only thanked her for feeding people at the wake but for having the foresight to make enough leftovers to help the family during their mourning. Again, an invitation lets them know that they are welcome, even though the funeral thank you note wording used here also lets them know that now may not yet be a good time. The Eulogy that you prepared for Grants funeral was beautiful. I am grateful that you could speak for us. You said everything I know we wanted to, but could not find the words. Grant was important to this community, his friends and his family. I am glad you could mention all of them. It takes a lot to put aside the grief and write a Eulogy that not only describes the life and works of a loved one but inspires joy in the ones he left behind. Writing funeral thank you notes is a delicate and difficult task. But you will find that filling each one with personal thoughts and gratitude will lighten your heart and ease the pain, even if just for a little while. Want to help inspire others? Post some of your best thank you notes, and we'll publish them on this page.